ROCHESTER, Mich. – Searching for that perfect gift for your Valentine? 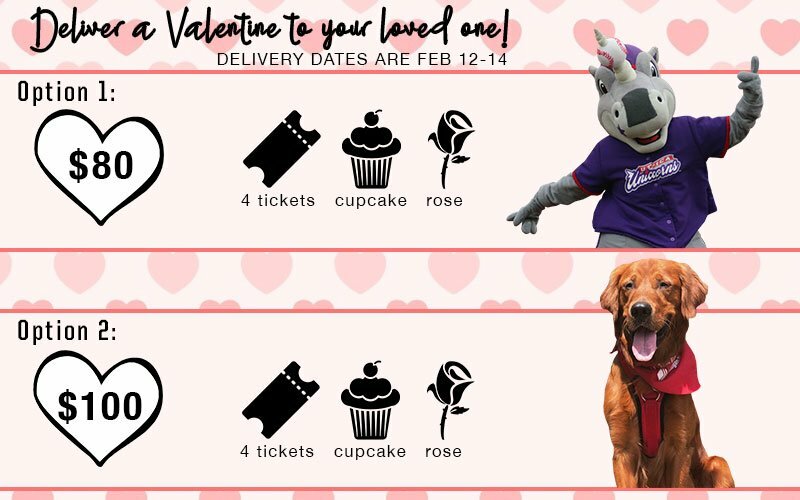 Then let Lancelot or JJ The Field General make this Valentine’s Day exceptional by delivering a rose, presented by Thrifty Florist, cupcake and a voucher to redeem four tickets* to your special someone. Make this a memorable Valentine’s Day with a visit from Lancelot for just $80, or a delivery from JJ for $100. Contact the United Shore Professional Baseball League by Feb. 8th at 248-266-8264 to schedule Lancelot or JJ. Delivery will be available on Tuesday, Wednesday or Thursday, Feb. 12-14, and must be within 30 miles of Jimmy John’s Field. * Orders must be received by Friday, Feb. 8 at 5:00 pm. USPBL Partners with Great Lakes Bat Co.